A new bank policy demands that all employees be high school graduates. Lucy reveals she had measles which prevented her from finishing her final exams and graduating from High School. In order to keep her job at the bank. 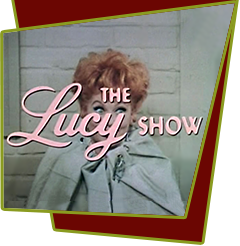 Lucy must go back to high school where she disrupts classes to finally earn her diploma. While there she helps a troubled young man, Steve Josephs, earn his diploma. She convinces him that education is important, even after he puts itching powder down her blouse. Special Notes: Lucie Arnaz does her largest TV part to date. She appears in this episode as one of the high school students, Patty Martin. She shares a scene with her mother, Lucy and they sit together at the graduation. Lucie Arnaz also meets fledgling actor Philip Vandervort, who played student Alan in this episode and within a few years, they will become married. Bloopers: In episode #41, "Lucy's College Reunion", Lucy is shown attending her college reunion, now she's a high school dropout?